Since a great garden begins with good soil, make sure to give your dirt special attention when preparing your garden. The key thing to remember is this: soil is made up primarily of solid matter, air and water. The latter two are critical for the successful growth of any vegetables, fruits, flowers or shrubs you plant. Soil preparation at the start of the gardening season creates space within the solid matter to hold additional air and water. This, in turn, provides soil microorganisms with the compounds they need to break down organic matter into nutrients that plants can use. And at the same, it helps the plants take up those nutrients and flourish. In preparing your soil, you may also want to add a layer of fresh compost to the top. This will replenish many nutrients back into your soil, which will help to ensure healthier plants. And don’t forget to pull all those unwanted weeds! They can take over your garden and steal valuable nutrients and water away from the plants that are in need. First things first, you want to make sure that your soil is ready to be worked with. It should be warm and dry enough that the soil crumbles in your fingers. Run your Mantis Tiller/Cultivator back and forth over a small area. The curvy tines, spinning at 240 rpm, create a consistent, properly aerated mix of topsoil and subsoil up to 10″ deep. And at the same time, they bring buried rocks up to the surface for easy removal. It is also a good idea to let the tilled area settle for a week, and run your Mantis over the area again before planting. Use the handy Vegetable Planting Guide to help you choose what to grow. Why strain your back digging? The Mantis Tiller/Cultivator makes it an easy step-by-step process. First, loosen the topsoil over the area to be planted with the Tiller. Next, remove the loose soil to a tarp or garden cart. 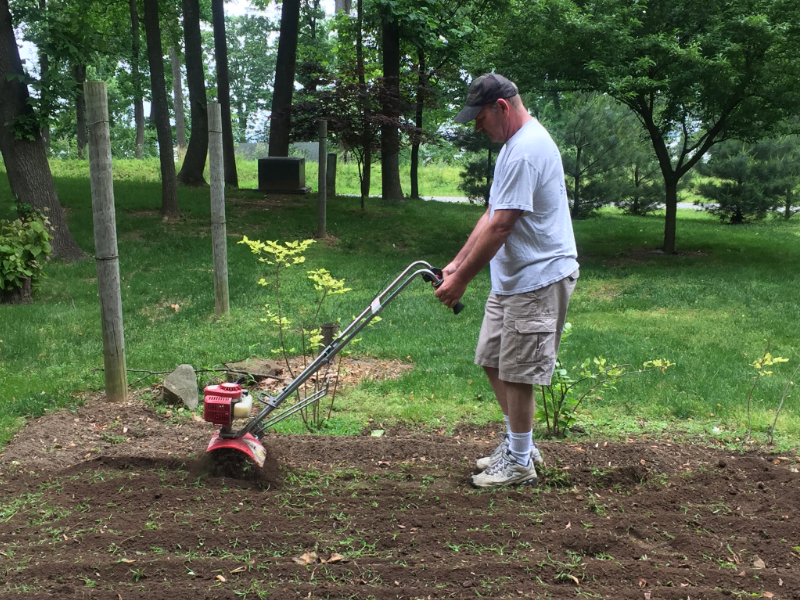 Then, loosen the next layer of soil by working the Tiller’s tines back and forth and gently rocking the tiller side-to-side. Remove this soil and repeat the process until the hole is as broad and deep as you need. Adequate water supply is necessary for any new flower, plant, or shrub during the first few weeks. A watering can is a great way to apply water directly to the base of any plant without over-watering it. Reverse the tines on your tiller and use it as a cultivator. Since it cuts a swath only 9″ wide, you can easily tear up weeds and loosen soil between closely planted garden rows. Plus, you can work closer to valuable trees and shrubs. And because you control the depth of the tines, you can cultivate the top 2″ to 3″ of soil without damaging the tender roots underneath. When the garden season is done, start preparing the soil for next year. Pile a 2 to 3 layer of organic compost on the top of your garden. Use your Mantis Tiller to mix the compost into the soil. The materials will have all winter to decompose and leave your soil well nourished for the next season.